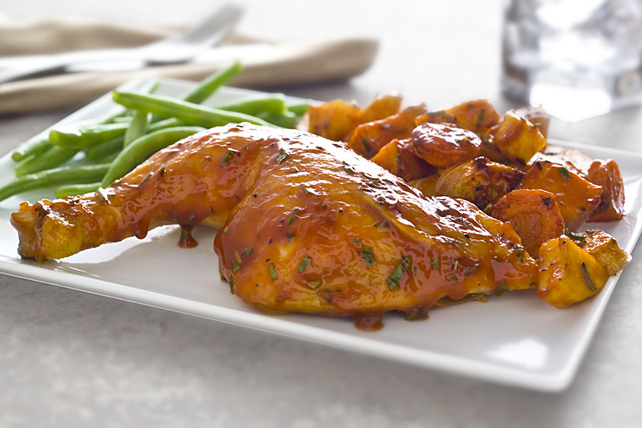 Using the barbecue sauce to glaze both the chicken and vegetables in this deliciously rustic roasted dinner has the additional benefit of creating a thick and savoury pan sauce. Mix barbecue sauce, herbs, oil and garlic until blended. Reserve half the barbecue sauce mixture for later use. Combine vegetables in large bowl. Mix remaining barbecue sauce mixture with 1/2 tsp. pepper. Pour over vegetables; toss until evenly coated. Spread onto bottom of roasting pan sprayed with cooking spray. Bake 20 min. Reduce oven temperature to 350°F. Spoon vegetables to side of roasting pan. Place chicken, breast side up, in centre of pan; sprinkle with remaining pepper. Remove half the reserved barbecue sauce mixture; set aside. Brush chicken with remaining barbecue sauce mixture. Bake 1 hour or until chicken is done (165º), stirring vegetables and basting chicken occasionally with remaining barbecue sauce mixture. Transfer chicken to cutting board, reserving vegetables and sauce in pan; cover chicken loosely with foil. Let stand 10 min. Carve chicken; place on platter. Use slotted spoon to transfer vegetables to platter. Spoon pan sauce over chicken and vegetables. Serve with steamed fresh green beans. Prepare using Diana Sauce Gourmet Original BBQ Sauce.